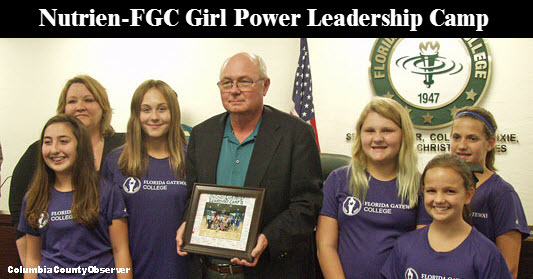 COLUMBIA COUNTY, FL – A partnership between Florida Gateway College (FGC) and Nutrien at their co-sponsored Summer Girl Power Camp was tremendous success according to everybody. It was all smiles last night as some of the girls who attended the camp gave an autographed photo to Nutrien's Mike Williams. FGC Vice President Jennifer Price addressed the College Board: "Mr. Williams, we want to thank Nutrien for sponsoring our Girl Power Leadership Camp this year. Because of Nutrien's generous donation these are some of the girls that were able to be scholarshipped to attend the camp this year. 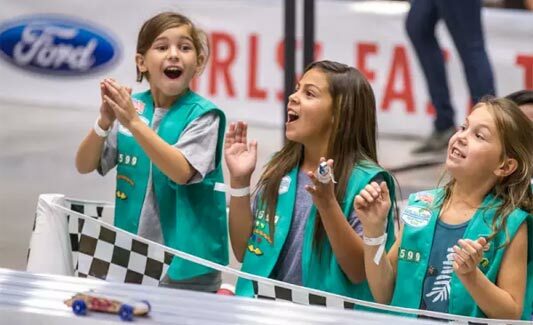 We were able to scholarship 30 girls to attend." Ms. Price continued, "They were amazing. They had so much fun. They learned about leadership and development and things that are going to affect their future. They have something they want to give you." All the girls had signed a photo and presented it to Mr. Williams. Mr. Williams told the girls, "I'm sure that all of you will excel." College President Larry Barrett remarked, "There is such a sense of renewed energy in these camps. Thank you Nutrien for doing that camp for us." In lobby after the presentation, Mr. Williams told your reporter, "These young ladies should be able to be everything they can be and their future should not be determined by gender." He continued, "Nutrien supports the breaking of the glass ceiling and woman empowerment. We have women engineers, mining engineers, and women at all levels of the company." Mr. Williams' remarks are supported by the Nutrien website which says that the company "values diversity." It was one big smile in the lobby and the girls, parents, and staff are already planning in anticipation of next year's camp.